Since time immemorial, people have searched for ways to have more beautiful smiles. One of the most modern developments in smile design is porcelain veneers. Want to cover up discolored teeth? Keep people from seeing cracks or chips? Close gaps? Have a straighter-looking smile? Porcelain veneers can help with all of these cosmetic concerns. Why Choose Robison Dental Group for Porcelain Veneers? 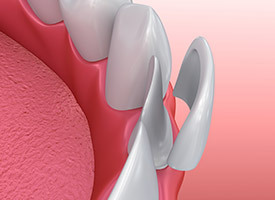 Porcelain veneers are comprised of super thin layers of dental porcelain that are adhesively bonded to the facial side of the teeth in your smile zone. When you meet with Dr. Robison, he will evaluate your current smile and your facial aesthetics including your skin tone and hair color. If there are particular features that you would like your smile to have, this is the time to mention them and talk about your smile goals. Your custom made porcelain veneers will be designed based on this evaluation. Applying porcelain veneers typically requires two appointments. At the first, Dr. Robison will minimally reshape your teeth by removing a small amount of each tooth’s enamel. 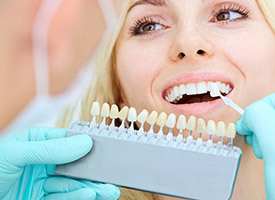 Then, we’ll take a mold of your teeth, so our cosmetic dental lab can fabricate veneers that fit perfectly. While your permanent veneers are made, you’ll wear temporaries. At the second visit, Dr. Robison will remove the temporaries and bond your custom porcelain veneers into place. In just about two visits, you have a brand new smile. Do you want a fresh, healthy, bright smile that will allow you to express yourself with confidence? Then please call Robison Dental Group and ask about porcelain veneers. Robison Dental Group in Canton, Michigan serves patients from Ann Arbor, Northville, Westland, and Plymouth, providing the area with general, cosmetic, and restorative dental care.